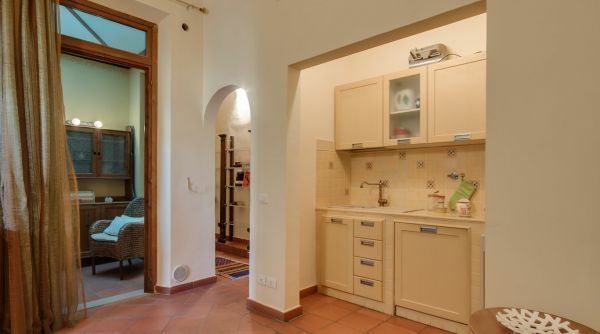 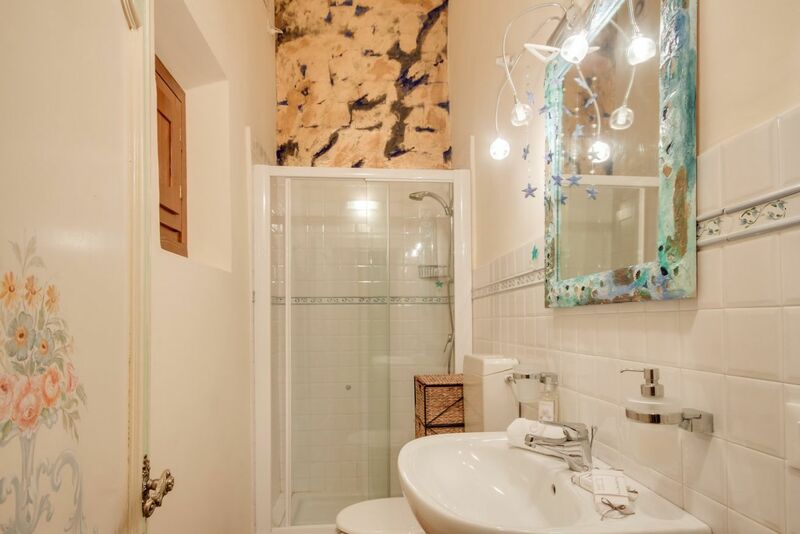 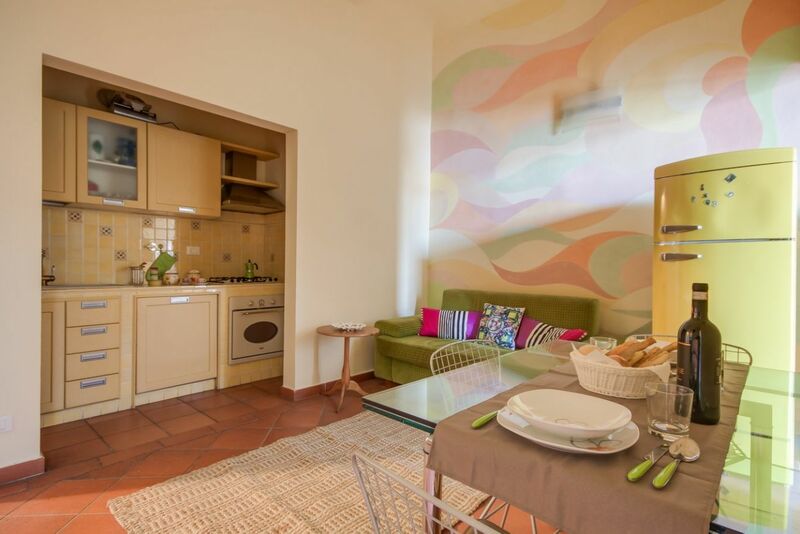 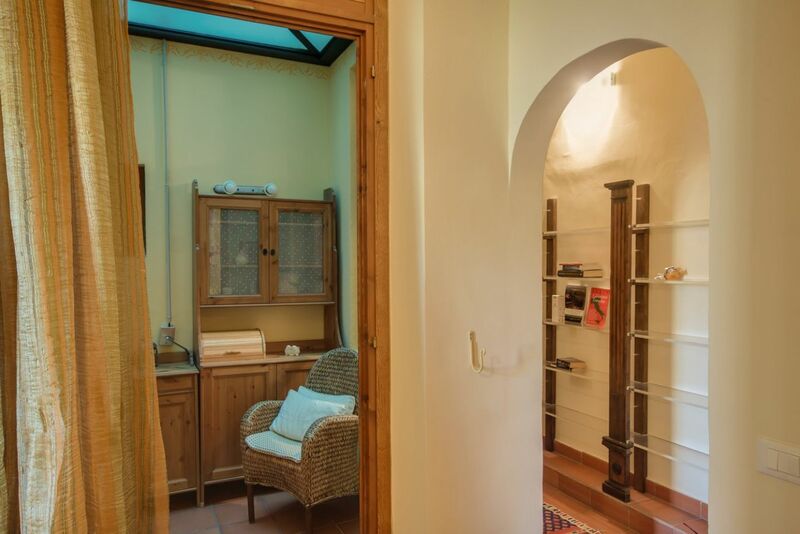 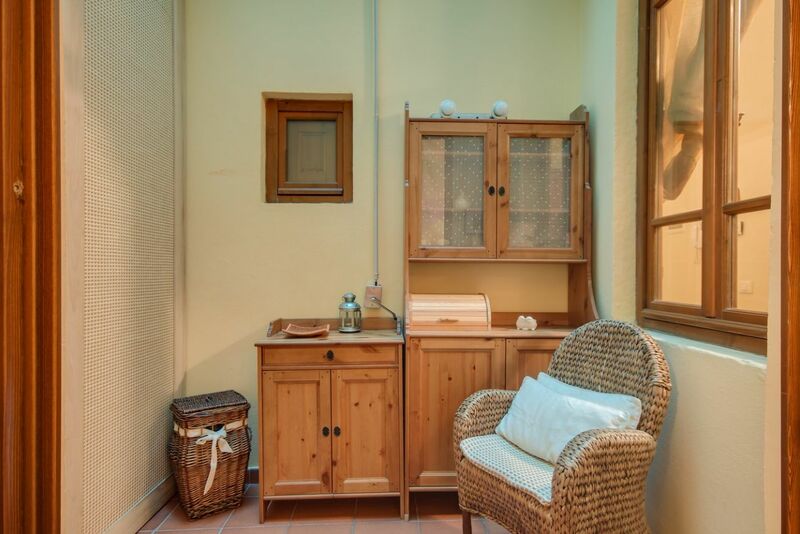 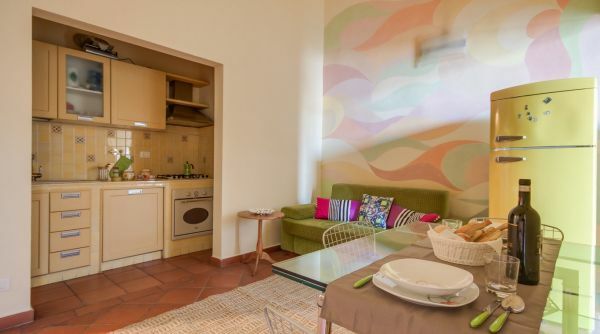 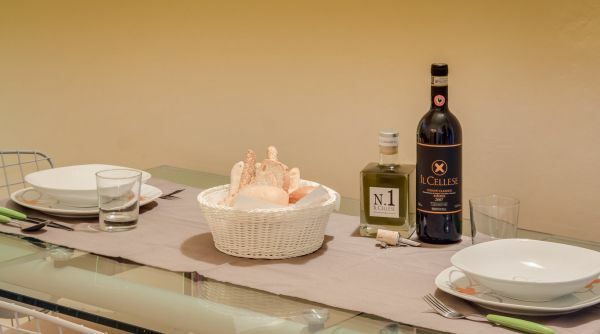 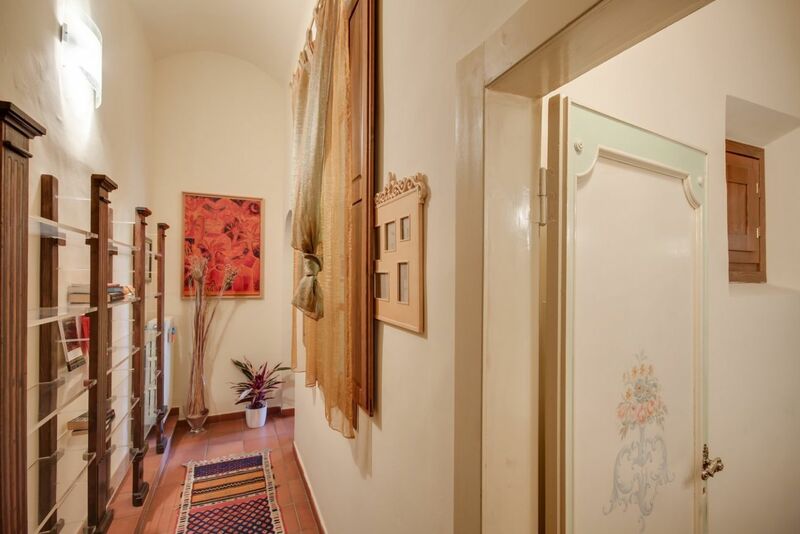 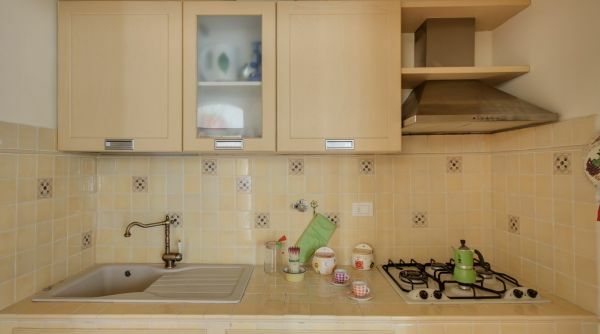 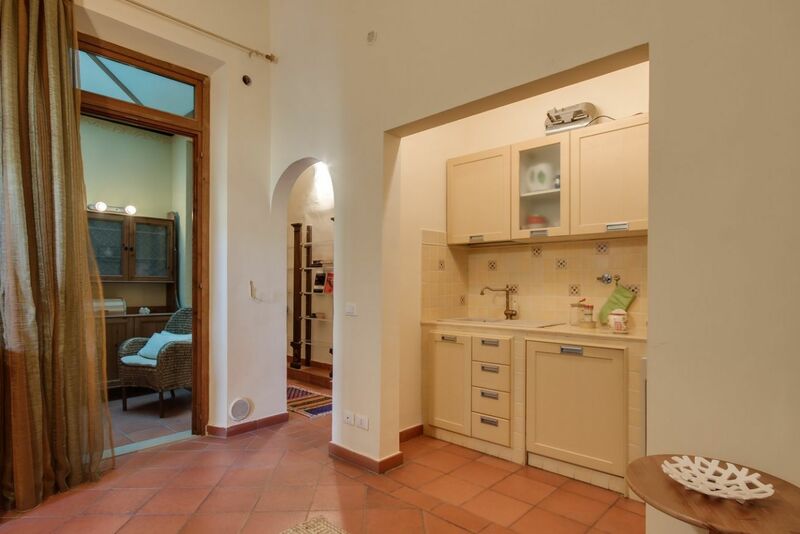 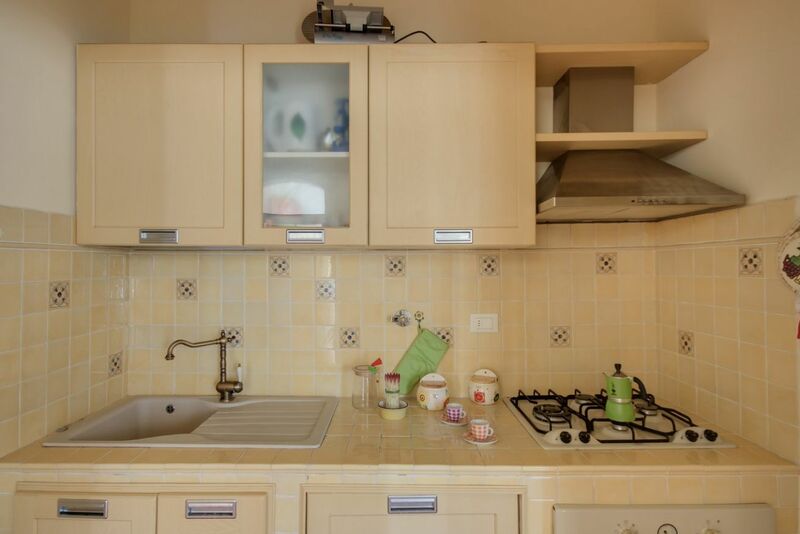 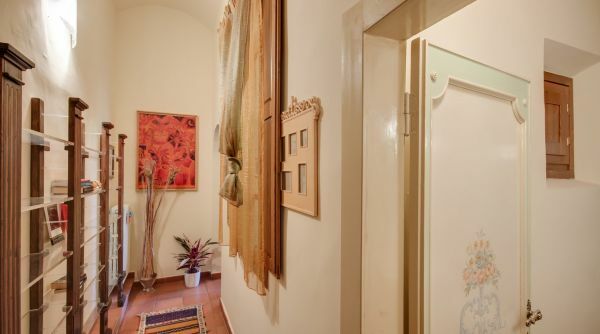 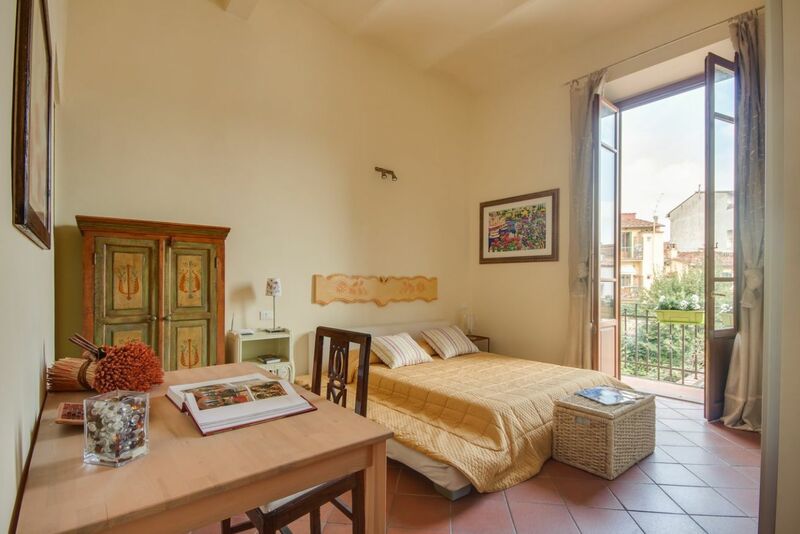 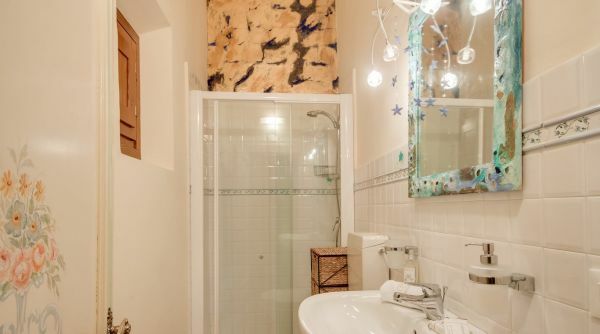 Lovely well-furnished vacation rental in Florence’s historic centre. 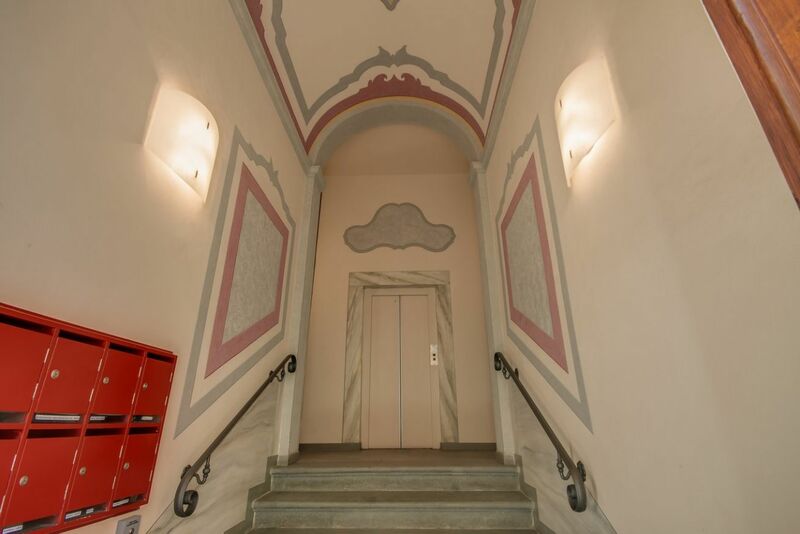 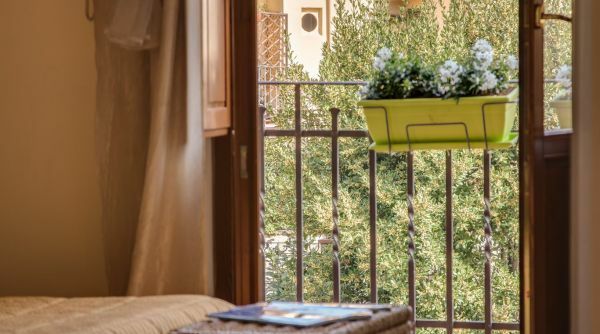 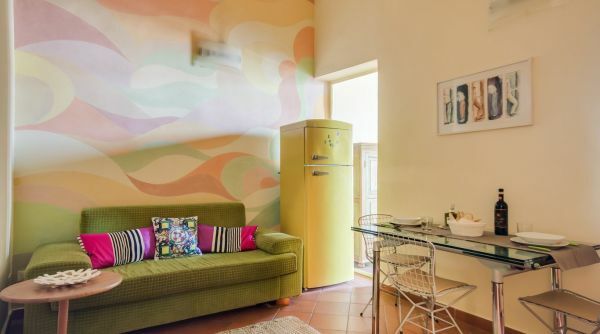 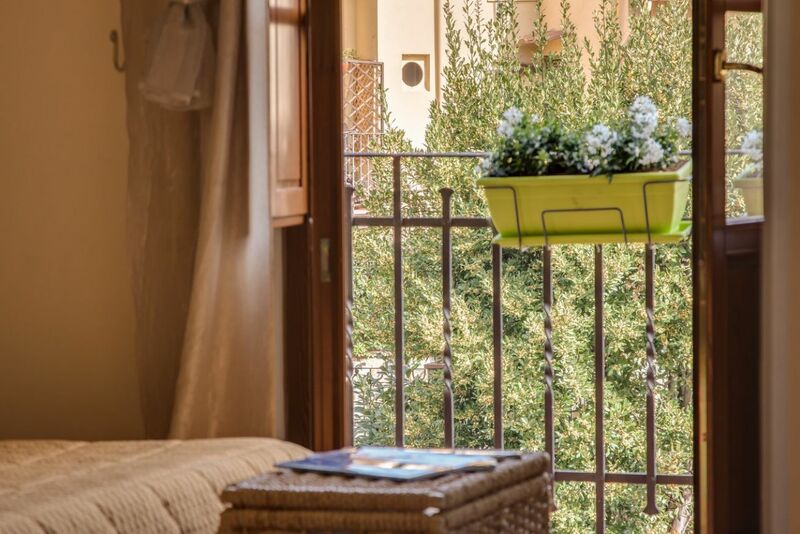 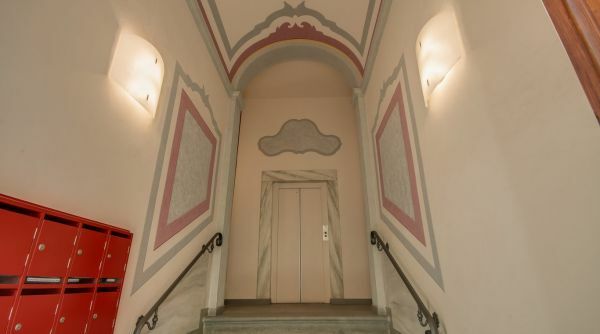 This cheerful apartment is located on the first floor of an elegant Florentine building with elevator, on Via Thouar , a bright street in the heart of Santa Croce. 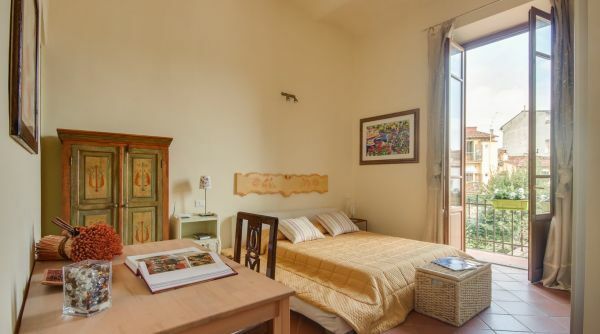 Less than a 10 minute walk to Piazza Santa Croce and within close proximity to many delightful local shops, pubs and restaurants. 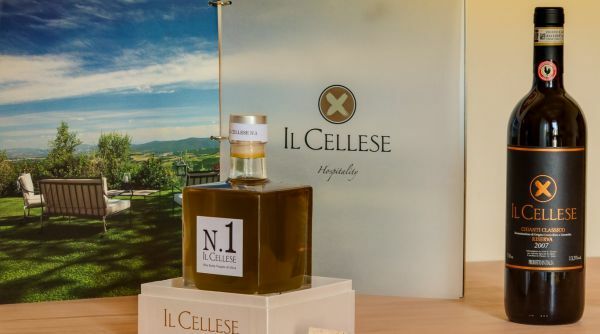 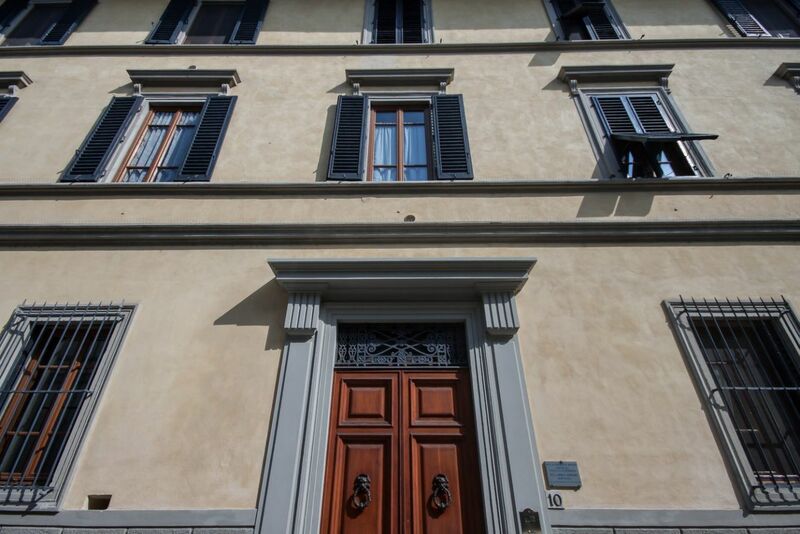 This lively area is full of Florentine charm. 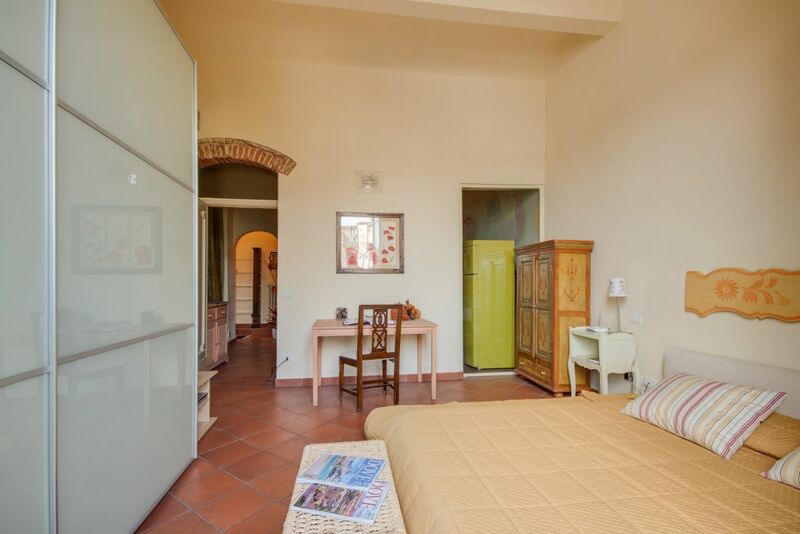 The apartment can accommodate up to 4 people with one bedroom, a sofa bed in the living area, one full bathroom and laundry facilities. 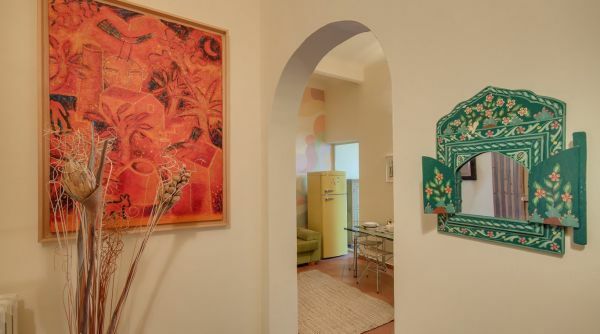 Bright colours and high ceilings create an open and airy atmosphere . 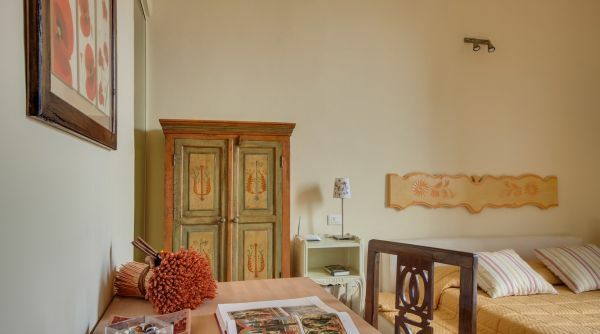 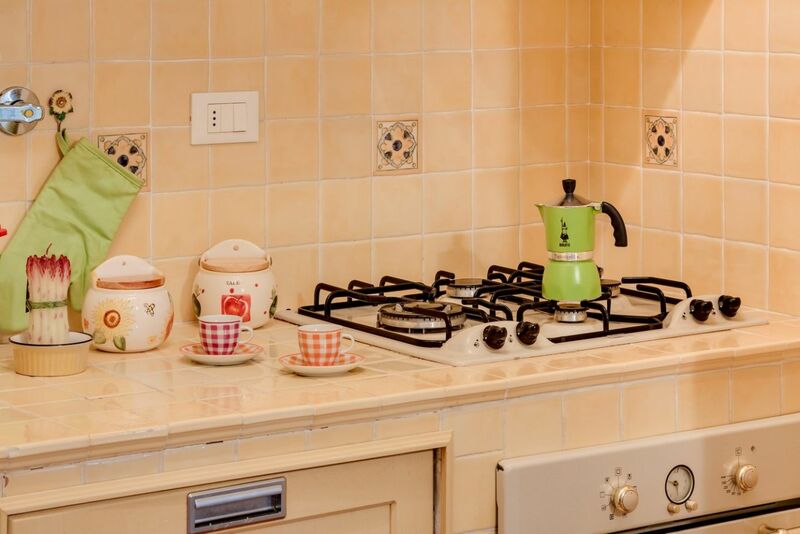 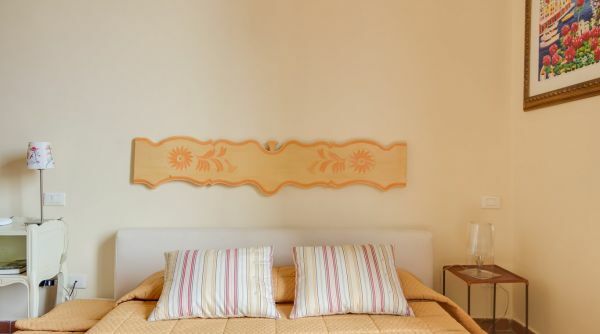 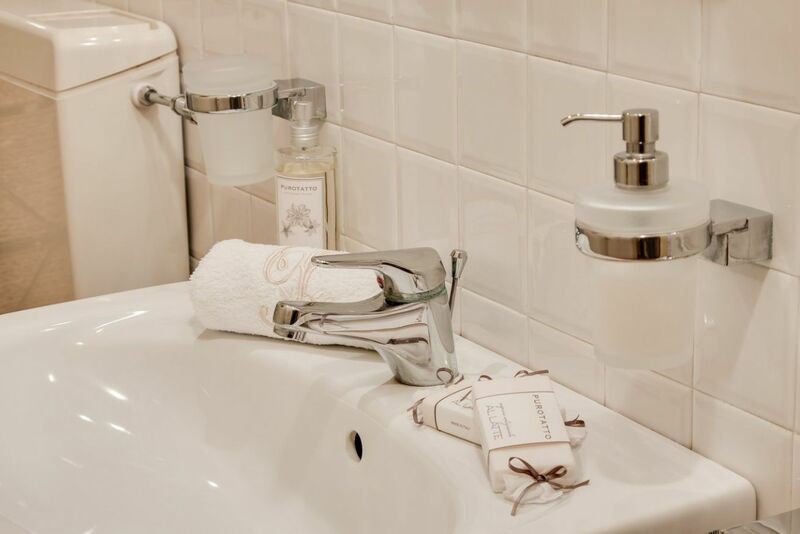 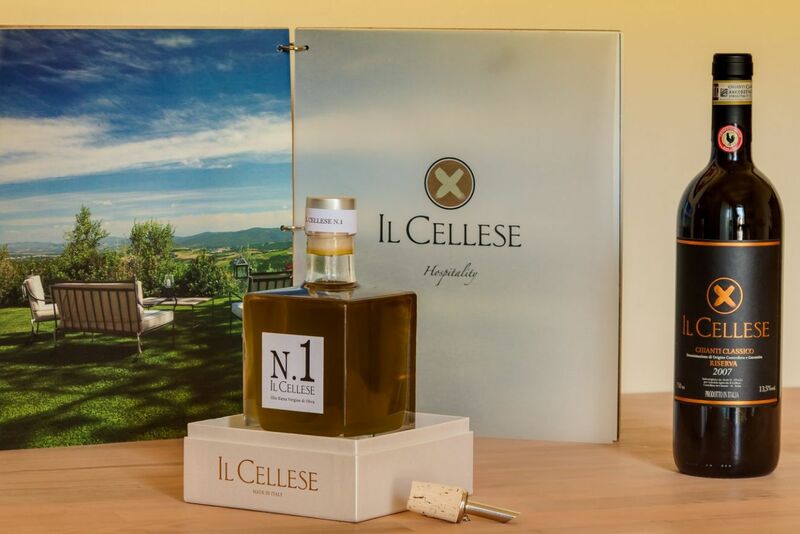 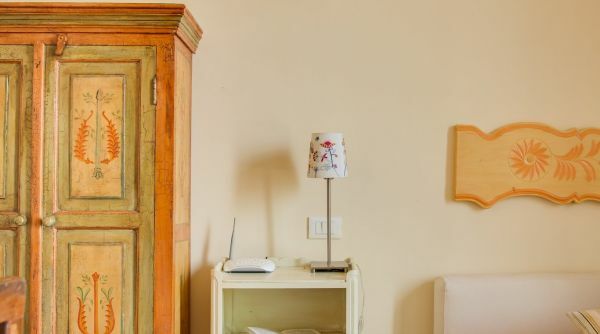 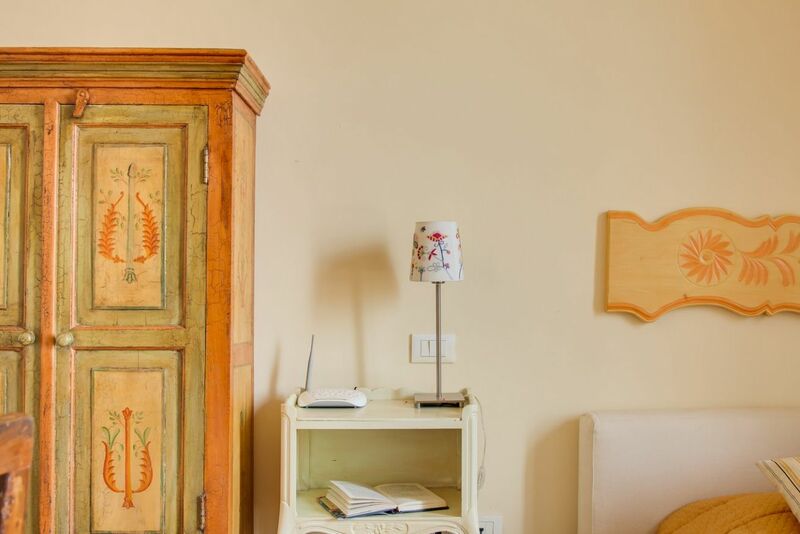 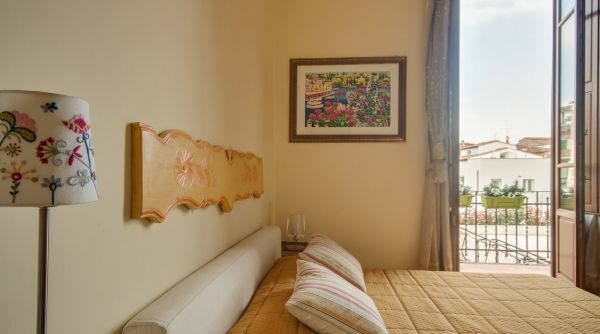 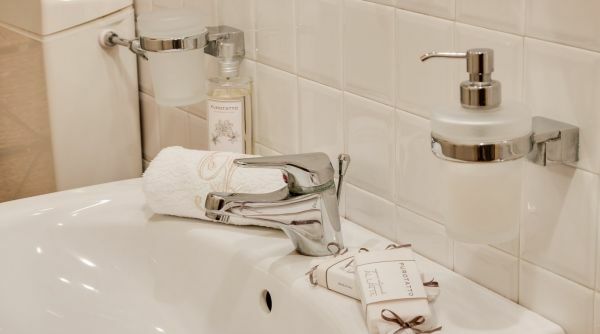 The apartment has been decorated with quirky touches, complemented with traditional Florentine character . 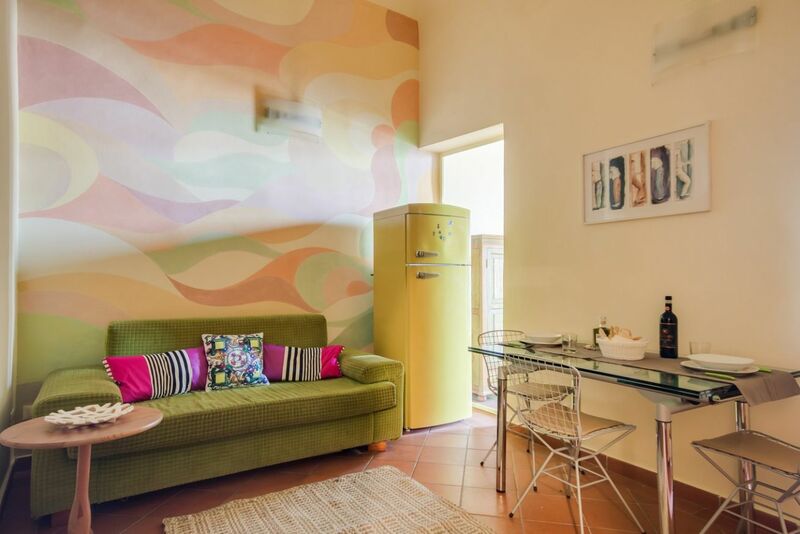 A colourful hand painted wall is the focal point of the spacious living area where you will find a full sofa bed lending to sleeping for 2. 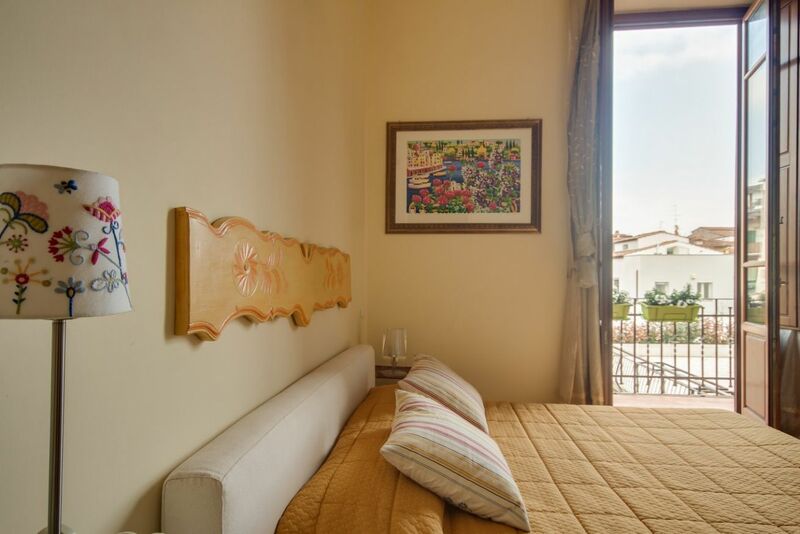 The luminous master bedroom with queen bed, leads to a delightful terrace overlooking the courtyard gardens of the building. 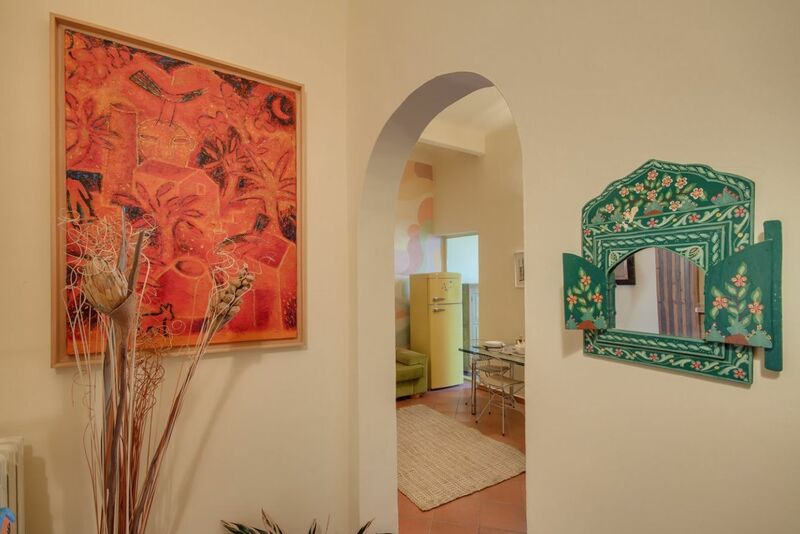 Hand painted furniture and doors add a lively element to the space. 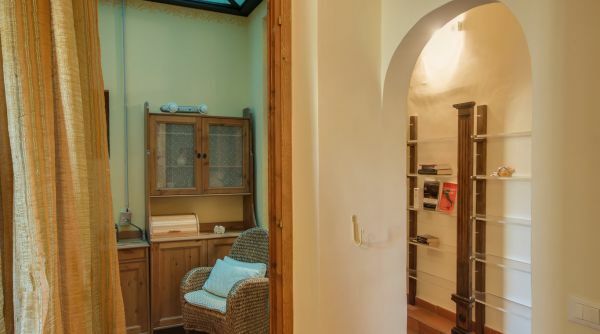 A small study off the bedroom with a skylight and large window, offers space to enjoy a moment of tranquility. 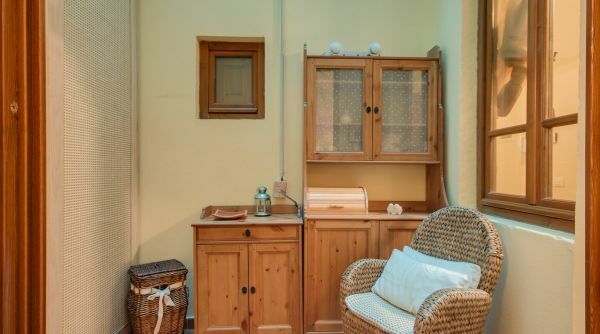 The cosy kitchen is fully equipped with all of the necessities. 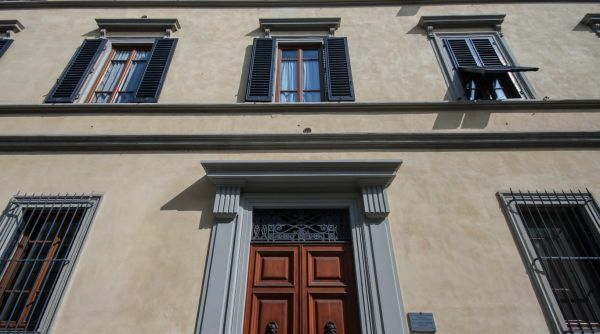 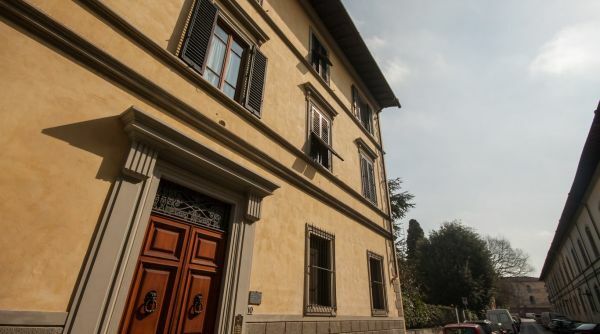 This pleasant apartment is ideal for a small family looking to enjoy all of the comforts of home within prime proximity to all of Florence’s most important landmarks. 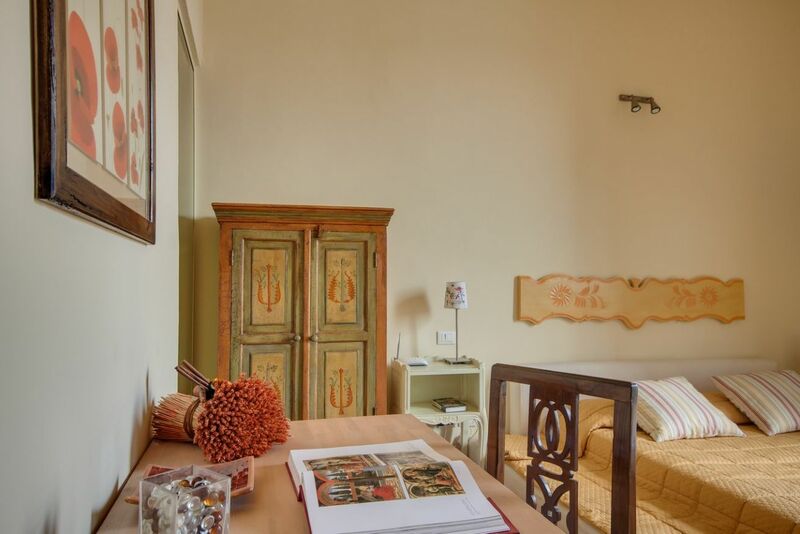 I had an excellent stay at the apartment at P. Thouar 10. 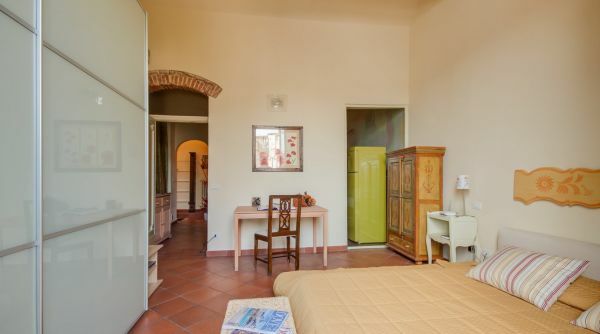 I was there primarily for a research trip, but I found the apartment exceedingly pleasant and quiet. 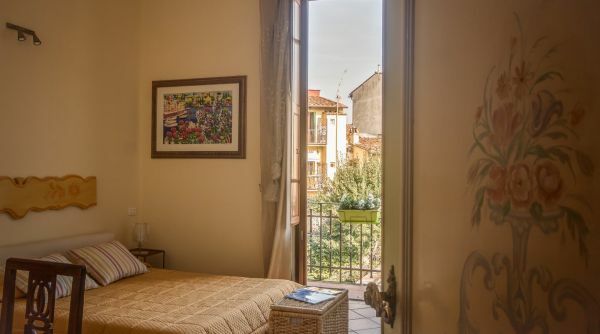 The air conditioner in the bedroom worked very well, and was more than adequate to keep me cool on hot Florentine evenings. 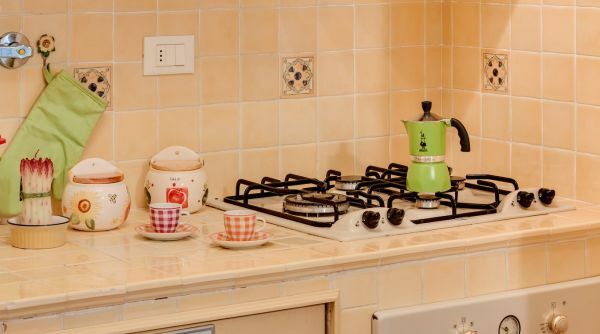 The appliances all worked well, as did the Wi-Fi. 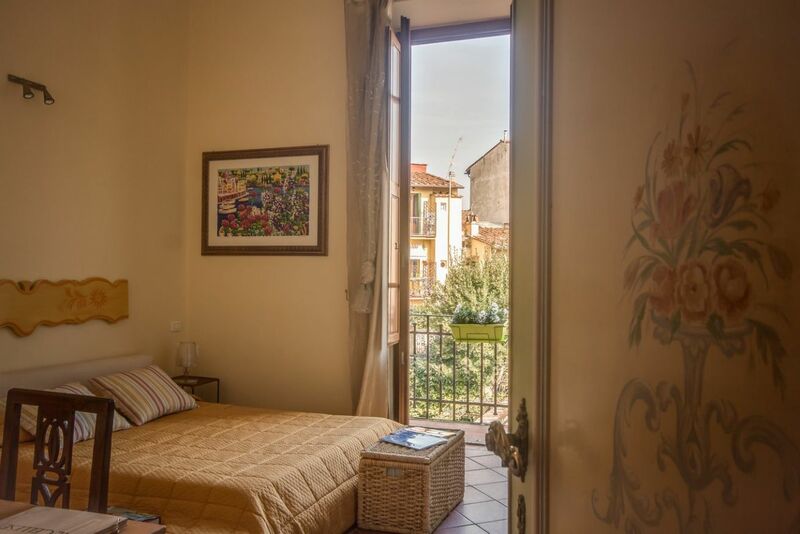 The location is also terrific for those on holiday, who wish easy access to the major museums and sites in the center of the city. 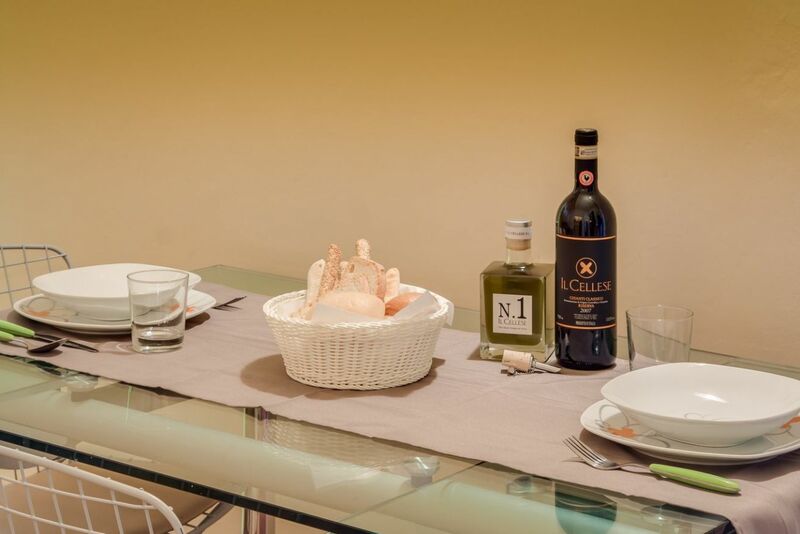 The market at Sant' Ambrogio—which is such a treat—is about a six minute walk. 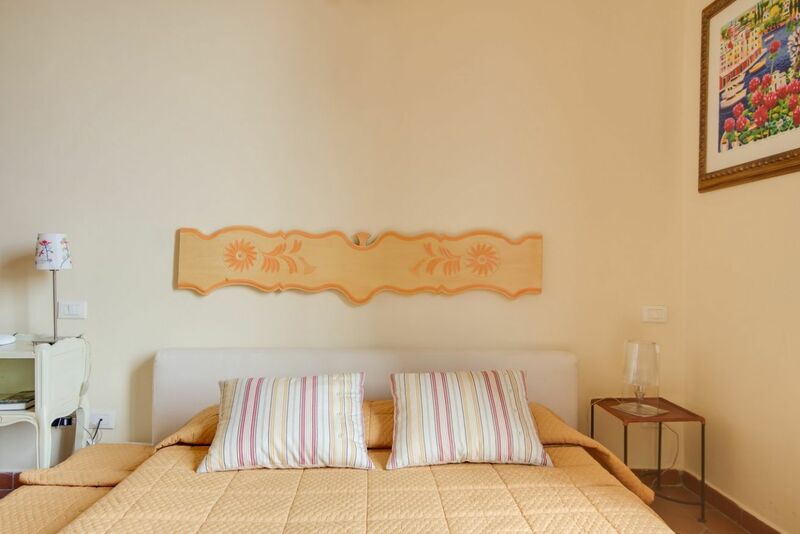 The bedroom is very bright and sunny, and while the other rooms don't have natural light, they are bright, cheery, and very pleasant. 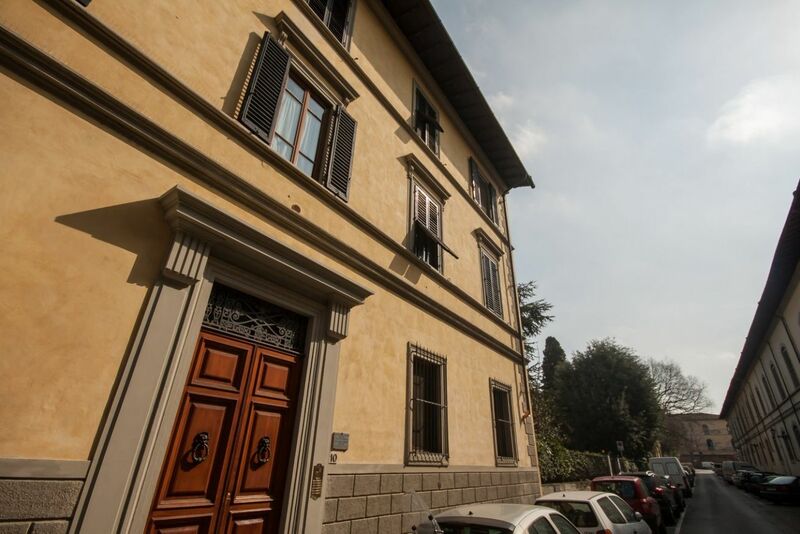 I found the Apartments Florence staff to be terrific; everything happened exactly as it was supposed to, and I would happily return to the same apartment (and probably will)!